I awoke at 6am and immediately had two realizations. One was that the distant cow bell alarm clock I was hearing sounded much like church bells this morning. The other immediate thought was, man the finger I cut with a pocket knife last night hurts. I tried to sleep another hour and then got moving. I was well hidden up on a rock. 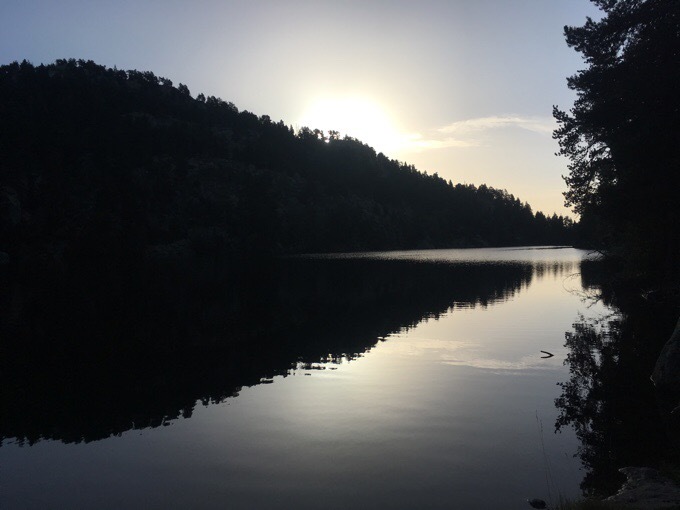 So much so that some early morning fishermen climbed up to scout out the lake, and it took them a minute to notice they were standing right next to my tent. I rebandaged my finger with some gauze and medical tape. It was too big of a cut for a bandaid and needed some padding anyway. It was sore and a bit bruised, but I was glad it didn’t reopen easily. It did hurt all day. Especially if I put it down at all. 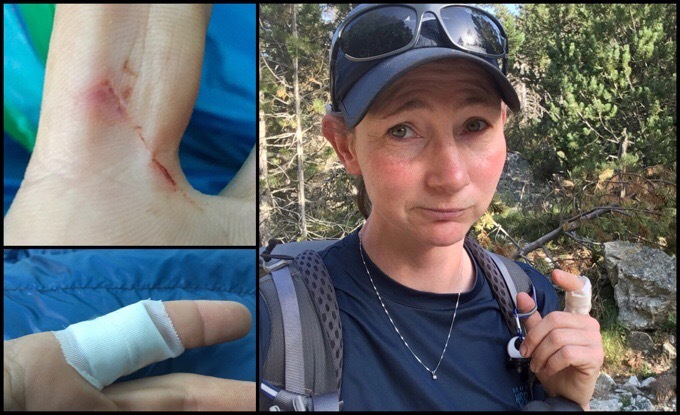 I hiked much of the day with my thumb or other fingers looped up on my shoulder strap since it wouldn’t throb as much if it was elevated. I’m going to let it be for a couple days before I mess with it again. Even a paper cut in that spot would hurt, so I’m just going to have to tolerate it for some days as it heals. At least the hiking today was easy. Possibly the easiest day of the whole route. It was greatly welcomed after what I felt was a stressful day yesterday. 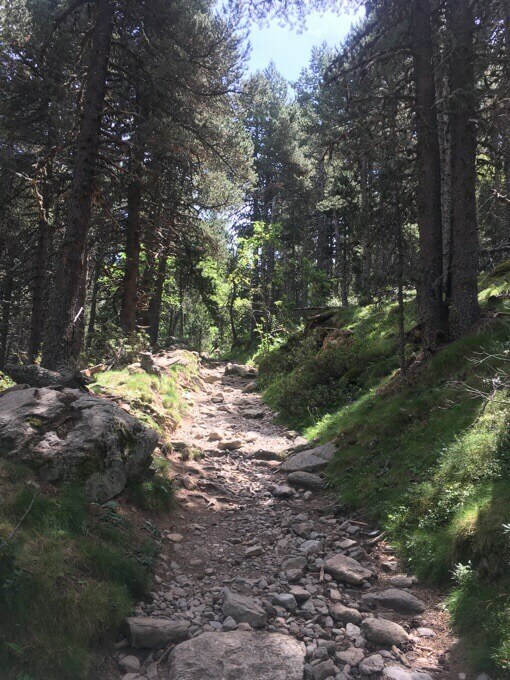 Today started off with some nice hiking along some lakes until the route met up with the GR10 again and followed a forest road for a couple hours. Very relaxing! It was great multitasking trail! I was able to get some things done as I got cell service closer to town including posting yesterday’s blog entry. 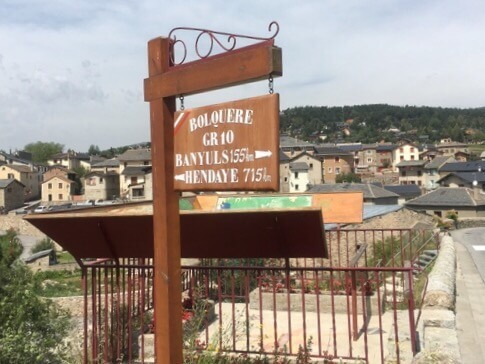 The final part of the morning was a road walk into the medium sized village of Bolquère where there was a store to buy food for the next 2.5 days. They had a cool sign for GR10 hikers. If you recall, the GR10 also goes from Hendaye to Banyuls-Sur-Mer like the HRP. I’ve been paralleling that and the GR11 and sometimes overlapping them like today for a bit. The sign said that along the GR10, I was 715km/444mi from Hendaye and 155km/96mi from Banyuls. Since my guidebook only gives times and not distances, it was cool to see that. Getting near the end! It was a decent sized store, and they let me charge my phone and battery while I shopped and ate my lunch at the picnic table out front. 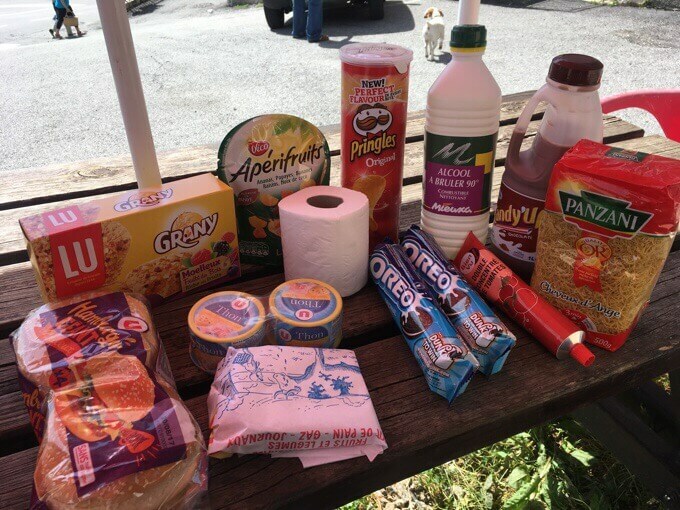 Once again, pickings were slim, so I got what I’ve been getting; pasta, concentrated tomato sauce, dried fruit to put in peanuts I already have, some little breakfast bars, cheese, tuna, Pringles, Oreos, and some buns since they didn’t have tortillas. It was a tough choice what cold chocolate item to have as they had ice cream bars, pudding, mousse, and chocolate milk. I’ve yet to find a decent chocolate milk, so I gave another one a try. Not awesome, and I’m not sure if it was actually milk (it was called Candy Up! ), but it was good enough and I drank most of the liter with my lunch of a tuna sandwich since they didn’t sell sandwiches. Yes, I also got some toilet paper after using most of it to stop the bleeding finger last night. Some have asked what I use for fuel for my alcohol stove here. It’s a cleaning fluid called Alcool A Bruler in France and Alcohol De Quemar in Spain. Pretty cheap at ~2€/L. I haven’t had a problem finding it (though there are not many in stock often) and just pour what I need in my bottle and give the rest back. 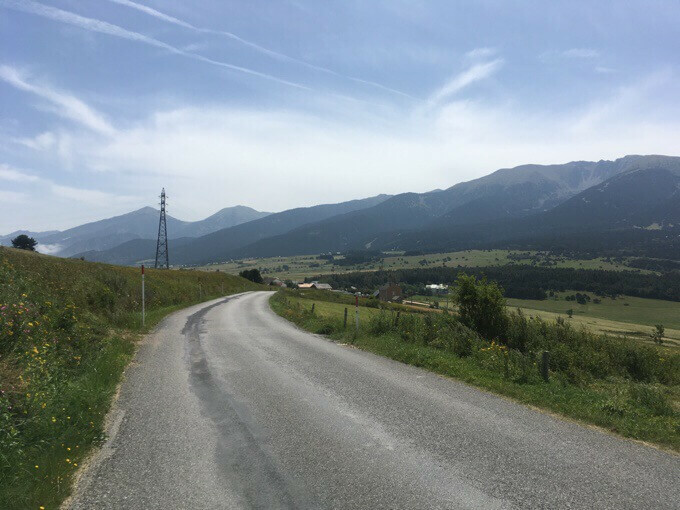 I walked out of town about noon and had another road walk to the small village of Eyne, which had places to stay, but no stores. Clouds were gathering, and I knew there was a chance for showers. 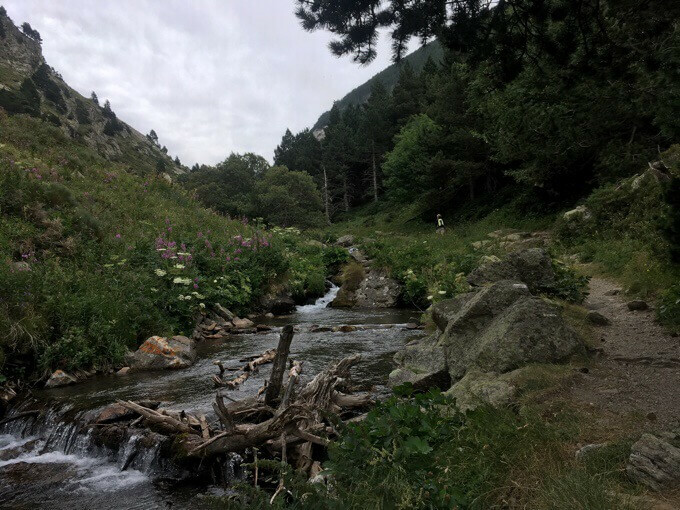 An older Frenchwoman that knew no English at all talked to me earlier in Bolquère familiar with the fact that hikers walk through her town. She was quite fond of the hiking and through charades, I also got from her it would be quite windy today. That was disappointing to hear as I’d gotten my fill for awhile yesterday. I checked the weather. I have found yr.no to be quite spot on ever since I started using it last year in Australia and New Zealand. It showed moderate wind and some showers from 3-5pm. I knew it would probably be worse as I hiked out of town and into the mountains. 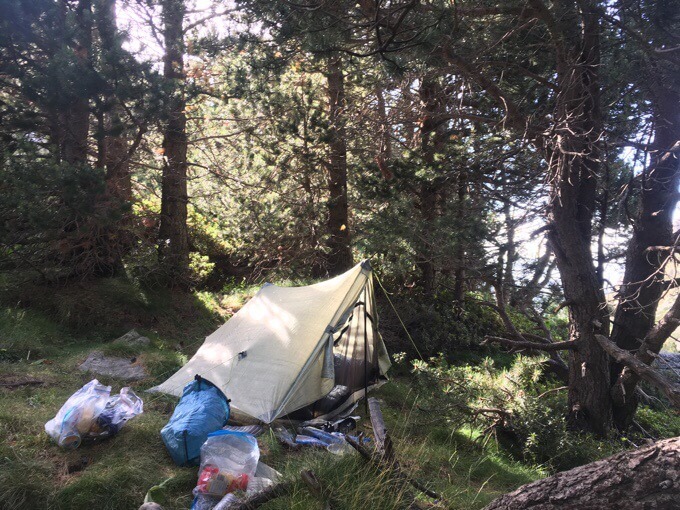 It was only 1pm, so I told myself I would hike as far as I could, and if it got bad, I’d put up the tent. I’m not in a hurry and really feel no need to be in that kind of weather if I don’t need to be. 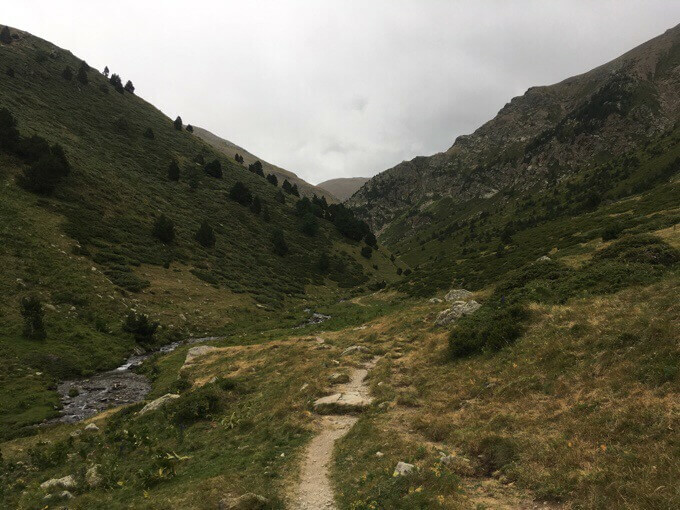 The hike up the Vallée d’Eyne was nice and gradual. Starting out in the woods and then opening up more and along a nice stream. There were tons of people out as this is apparently quite a popular valley for day hiking. Most were on their way down with the weather shifting, so I was against the grain. Right before 3pm, the rain drops started. I kept going, waiting to see if it would really turn into anything. It didn’t look ominous, but I also didn’t want to get stuck in wind and rain. The wind out here is so strong that even a drizzle can feel like a downpour. Here are photos looking back and up the valley. I got to the much more open section and kept an eye out for spots to camp in case it got worse. Yep, it did. The wind really picked up and rain was coming in spurts. I looked ahead and realized I was going to have to decide if I wanted to commit to complete exposure. I’d just passed a good sheltered spot and took note of it. Then the wind really picked up and rain came down. Decision made, I was taking the sheltered spot! Here’s a video to get an idea of how it can be out here. I’ve been super fortunate with weather this whole hike! Even though it was only 3pm, I was quite happy with my sheltered spot by the stream, and chose to stay. Plus, I had cell service! I had plenty to keep me occupied. It remained windy the rest of the evening and I’m so glad I picked a spot where the tent hardly moves it’s so sheltered! It would be tough to sleep in this otherwise. It also rained lightly on and off until 7pm. Yep, definitely happy with my choice! I even got to talk to Why Not and Jim who were walking into El Serrat. Tomorrow they are sending my pot to Banyuls-Sur-Mer, the end of the HRP. I did the math, and have a finish date now with about 5 more days of hiking left. I should arrive on a Sunday, but will not take the train out to Geneva (the start of the GR5) until Monday after the PO opens and I get the pot. I was even able to buy my train ticket online. It feels great to have that all figured out! Well, hopefully, I’ll sleep through all this noise of the wind gusts. No tent flapping, so that’s great. I have the movie Money Monster that came out last year directed by Jodie Foster and starring George Clooney and Julia Roberts that I’ll start tonight. Not the most favorable reviews, but those are three of my favs. 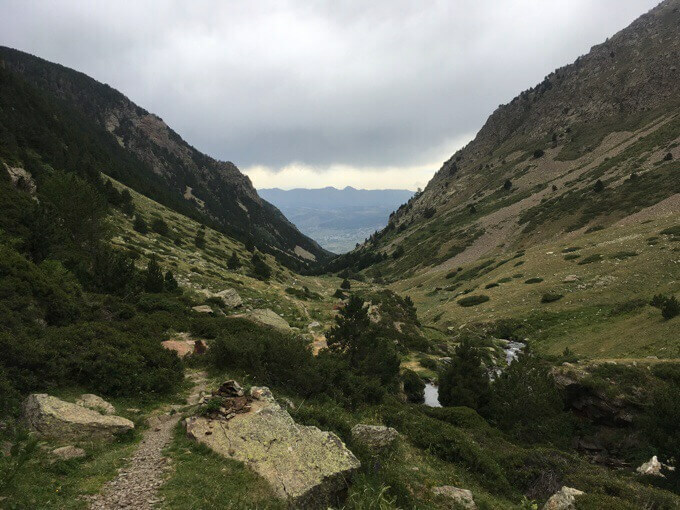 I really enjoyed the next couple of days after this .. the pic de Noufonts, 2861m, the col de neufs croix.. all the way along to the refuge de Mariailles is great walking, and all over 2000m up. Where will you stay in Banyuls? Funny thing, the only gale I had in the Pyrenees the last time I went was in the vallee d’Eyne.. perhaps its prone to them! Not sure where I’m staying yet. Advice on that? … from memory it was about €70 inc, breakfast .. Banyuls is a nice place, but not particularly cheap. Very comfortable, small hotel.. only 6 or 7 rooms, more of a B&B really, .. good central location. Good wifi, spoke a little English. Wind, Rain, Sore finger—but—OREOS…..all better! !